The chef in Nicole Mones' The Last Chinese Chef would not approve of Breville's Electric Gourmet Wok. Of course, she was going for authenticity and not convenience. So, unless you're competing in a fictional Olympics of Chinese culture, you're probably safe with Breville's electric wok. And you won't have to go all the way to China to get it! 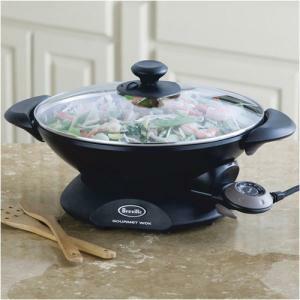 The 14-inch-diameter die-cast wok bowl has a six-quart capacity and is evenly heated by a 1500-watt butterfly element that is recessed around the base of the wok. The heat is controlled by a variable heat probe with 14 settings, including a "high sear" setting. This allows you to precisely control temperature and cook times. The wok's surface is a four-ply Quantanium coating, combining titanium-reinforced mid-coats with a long-lasting non-stick exterior, making for a scratch-resistant, easy to clean cooking surface. The four-ply Quantanium coating, which admittedly sounds like something from the space age, also means reduced-fat cooking because less oil is needed. The glass lid, rimmed with stainless-steel, has a convenient steam vent. The quick-release base allows you to put the wok in the dishwasher (sans temperature probe and power cord, of course). Your wonder wok also comes with a booklet of recipes and tips, as well as a plastic spatula. I only wish The Last Chinese Chef came with a recipe booklet, too.